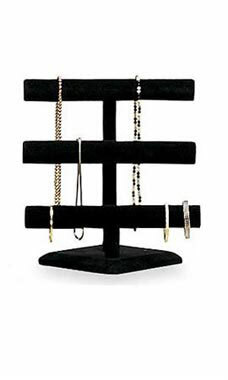 Showcase your delicate necklaces and bracelets quickly and effortlessly with our 3-Tier Black Velvet Necklace/Bracelet Displayer. The display bar has 3 tiers of display space designed to lend visual interest to your jewelry. Simply position the jewelry over the top of the display as close together or far apart as you like. The overall height of the display is 13”H.